ROOSEVELT LAKE — (2,121 feet, 66-percent full). The Roosevelt Lake water level continues to fall and now sits at 66 percent full. Downstream demand is more than 2,000 acre feet nearly every day, which is typical of summertime demand. The Salt River is flowing at 42 percent of its normal rate for this time of year. The Tonto Creek stopped flowing a few weeks ago. The water clarity is being called slightly stained with visibility down to about 10 foot. 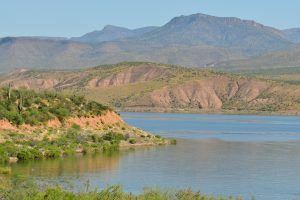 Summertime bass fishing conditions on Roosevelt Lake are good in spite of the high temperatures. The ambient temperatures remain at over 100 degrees and the temperature of the water in the lake is in the mid to high 80s. These high temperatures impact both the fish and the anglers. Fish are the most active in the very early morning, evenings and during the night. During the hottest time of the day, dropshot and Carolina rig techniques are the most effective. Bass can be found on main lake points in 15-25 foot depths. However, not all points will hold schools of bass. Those points with adjacent deep water access are the best to investigate. The current full moon phase provides a enjoyable night fishing experience. Always verify the weather when night fishing and beware of fast approaching monsoon storms. Have a plan to get off the water or where to seek shelter before the storm arrives. Crappie anglers are expressing frustration with the heat and low number of crappie being caught. A few crappie are being caught but overall crappie fishing is poor on Roosevelt Lake. Anglers are reporting small schools of crappie in the 20 to 25 foot depth but not large numbers of schools that would be expected at this time of year. Vertical fishing using a light line and a small 2″ grub-tail bait is the most effective summer crappie fishing technique. LAKE PLEASANT – (Lake elevation 1,680 feet, 84 % full). Surface water temperature has been in the mid-80 degrees. Water temperature has been up to 87 degrees. The lake level has risen 6 percent during the past week as water is being released from Horseshoe Dam. 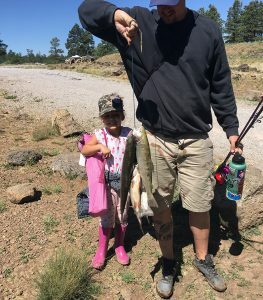 Gary Senft of the Mesa Bass ProShops fished Tuesday, June 20 and reported that the fish were “biting like crazy as always between 5 and 8 p.m. (air temperatures were 101 degrees at 5). 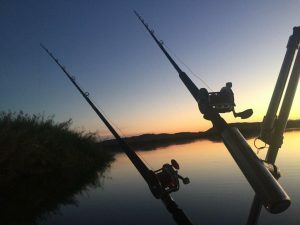 He said there was no sundown or night top-water bite, but fishing near the Yellow Cliffs Boat Ramp largemouth bass were hitting crankbaits, Texas-rigged brush hugs and dropshot-rigged Roboworms. Senft said the trick is to keep moving and cover a lot of water, fishing shoreline points, islands and REEF buoys. HORSESHOE LAKE – Lake elevation is 1,963 feet (3-percent full). Water is being released into Bartlett. When the lake is full, there are a lot of spawning fish. No new reports. LOWER SALT RIVER – On Thursday afternoon, the river was flowing at 967 cfs out of Stewart Mountain. The final trout stocking of the season is scheduled for this week. 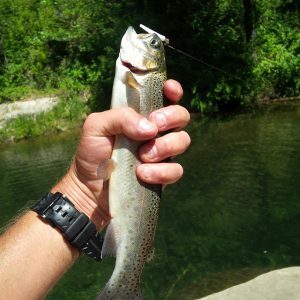 “The best fishing being reported is for Rim Country trout fishing — which is excellent. Good numbers and quality of trout are being caught throughout Rim Country lakes and streams. The AZGFD Summer Trout Stocking program is keeping many Rim Country lakes and streams stocked with large numbers of rainbow trout. The entire AZGFD Summer Stocking Schedule is available at azgfd.gov. PowerBait, Z-Rays, in line spinner-baits, worms and salmon eggs were all reported successful. Fly anglers are reporting nymph imitations for stream fishing. 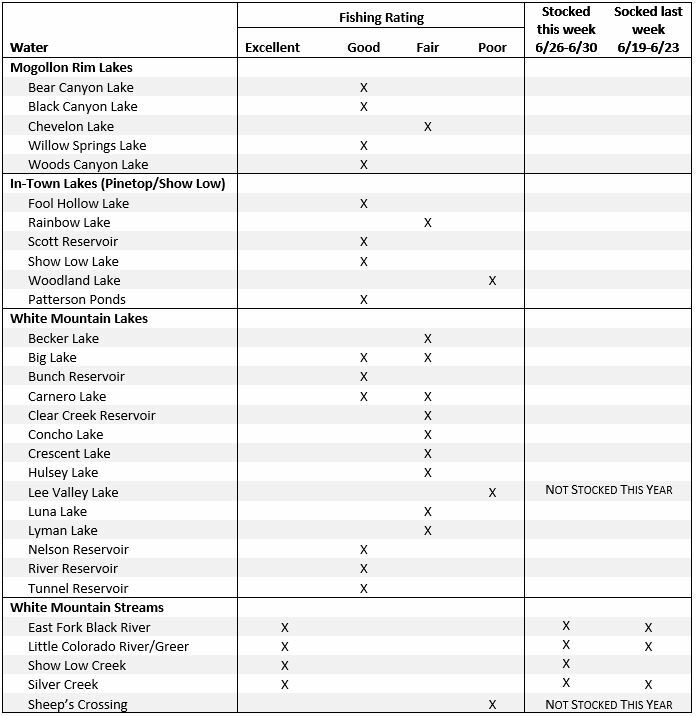 Many Rim Country lakes and streams have received higher numbers of stockings recently. If you are a novice trout angler, the East Verde River provides easy access at the Crossings. Watch for the signs as you drive on Houston Mesa Road. Each site has easy access to the river, restrooms and ample parking. BIG LAKE – Fishing is fair for rainbows, but good for cutthroat trout. Rainbow trout were stocked in late last week. Try fly fishing for cutthroat trout in the shallows. You can use a fly with a casting bubble if you don’t own or know how to use a fly rod. Cutthroat are rising on small midges. Joel M.: Caught four trout this morning, June 27. All measuring over 15 inches and one measuring 20 inches. Folks were catching trout on worms fished about 2 feet under a bobber Monday afternoon. Another angler was catching trout on the bottom on yellow garlic PowerBait. The last 2 days Kaibab Lake seems to have had a morning bite and an afternoon bite. Folks were catching trout on worms fished about 2 feet under a bobber or yellow garlic powerbait on the bottom from about sunup to about 10 in the morning then the fishing slows way down. Starting about 2:30 or so the trout started biting again. Folks are also catching crappie on jigs all around the lake, but the dock and the day use area near the group camping site seem to be the best spots. Has been stocked with channel catfish. I would try worms under a bobber or hot dogs. Yesterday afternoon folks were catching good numbers of trout using white, brown or green PowerBait on the bottom. Folks fishing in the shallow areas of the lake were doing better than those fishing in the deep areas off of the rocky areas. Folks fishing from boats or wading past the weeds are still catching some really big trout early in the morning and in the evenings. Fishing with worms under a bobber has been a good method to catch trout up to 21 inches with all of the fish being really fat. Folks are also catching fish on flies and lures. I had reports of folks catching rainbow trout and brown trout on Kinnikinick. This is also the time of year when catfishing can be good. Last week we stocked about 11,000 small tiger trout in Kinnikinick. Lake is open. No report. Goldwater is scheduled to be stocked with rainbow trout next week. Lynx Lake is still closed due to the Goodwin Fire. Wade and friend caught channel catfish. They launched at North Dyke and were using chicken liver to boat these beauties. Largemouth bass and crappies are also being caught but only in the early mornings or just before sundown. I wanted to tell you a little story about a big fish. Kent Taylor, John Taylor, Patty Taylor and Ted “TBone” McLoughlin started Saturday, June 24 like any other Saturday night of fishing, good friends, hot weather and cold refreshments. Catfish season is in full swing and we spent the afternoon and early evening fishing for bait fish and had a blast filling the bucket with bluegill. Once the sun began to set we found our way to a secret spot on the Colorado River near Martinez Lake. After setting up the boat with the rod holders, we began to fish for our favorite catfish “The Flathead,” king of the river. It was a quiet start to the night, catching one 8-pound flathead. We continued to play cards to past the time as John Taylor, Kent Taylor have heard all of my fishing stories. The quiet was broken with the sound of Kent’s fishing reel peeling line out, and as he set the hook, we knew that night was going to be special. After a great fight the 62.56-pound flathead catfish was landed — the excitement on the boat as you could imagine was unbelievable. This fish would be Kent’s personal best and after taking some pictures of the fish it was released back so that someone else can enjoy the feeling of pulling a monster flathead out of the water. As the night progressed we also caught a 26-pounder — what a great night of fishing, it was definitely one for the books. June 27, 2017. Non-Stop Action For Rainbow & Brown Trout! At the West Fork, I caught and released 49 beautiful Rainbow & Brown Trout, 21 of those I caught in 1/2 an hour… And at Grasshopper Point, I caught & released 30 beautiful rainbow & brown trout in 1 hour. All fish caught on 1.5 inch crappie tubes and 1.25 in plastic split-tail grubs. Weather Conditions: Sunny & Clear Water Conditions: Clear. My weekly striper slurp evaluation trip yesterday was quite interesting? We started earlier than usual (first light) and I attributed the lack of slurpers at my first stop at the mouth of Labyrinth to timing. Maybe we were too early? Then at the east wall in Padre Bay the lack of slurpers was disconcerting. Timing was right and the most dependable location at the mouth of Last Chance was also disappointing with no surface schools seen. See the full June 28 report from Wayne Gustaveson (www.wayneswords.com). It’s time to head out and catch some fish in the Yuma and Wellton area! Council Avenue (Somerton), Yuma West Wetlands, Fortuna Pond, and the Golf Course Ponds in Wellton were all stocked this morning (Friday, June 9) with thousands of pounds of channel catfish. ALAMO LAKE – The restriction on water skiing and the use of towable devices at Alamo Lake has been lifted as of Wednesday, May 24. The northern-most portion of the lake remains closed to water skiing and the use of towable devices due to the presence of submerged trees and other hazards (same as in the past). The boundary of this controlled use area is clearly marked with a buoy line across the lake, which will serve the purpose of both a “no ski” line, and to provide informational signage indicating that hazards are not marked north (upstream) of the buoy line. Signage for the latter purpose is pending, and will be installed shortly. Well folk, it’s be awhile. You have not been missing a lot. Although the lake is up, the fish are not cooperating in the biting department. I think several things are contributing to this: 1. The lake has never completely settled down; 2. There’s more shad in the lake then there are fish. High winds and storms just keep coming through. That’s my conclusion in a nutshell. You’re more than welcome to come on out and give it a try. Both ramps are open. We have docks at both ramps. 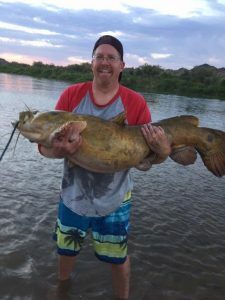 Jamie Goodman and Don Martin caught five channel cats and lost three more on Sunday morning (April 30) while fishing at Alamo Lake. The cats were caught on nightcrawlers in 6 feet of water. YUMA AREA PONDS – No new reports. Catfish stockings are winding down for the summer — the final stocking is this week. See the stocking schedule. MARTINEZ LAKE — No report. This tends to be one of the top early-bird bass lakes. 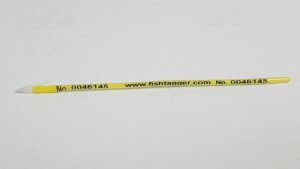 Visit FishAZ for all the latest information on fishing in Arizona. 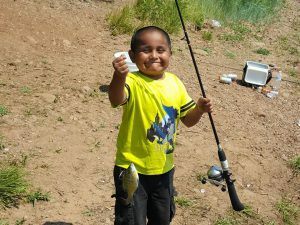 Please send your fishing reports from Southern Arizona to bfishing@azgfd.gov. PARKER CANYON LAKE — The lake received an extra 600 pounds of catfish this week. The White Sulphur Springs NFH released more than 1,800 Gila trout in Frye Mesa Reservoir on Monday afternoon, May 15.